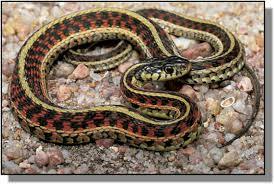 Today I want to write about a really cool snake, the common garter snake. These skinny snakes can grow up to about 130 cm long, but are more often much smaller, averaging about 55 cm long. Common garter snakes come in a wide range of colours, including black, brown, grey, green or red, with three stripes down the back and side that are either yellow, brown, green, blue, orange, grey or white. They are very fast hunters and excellent swimmers, which helps them to catch frogs, small fish, tadpoles, small birds, rodents and earthworms. Their saliva is slightly toxic, but their bite is harmless to humans. Common garter snakes have very interesting breeding habits. After hibernating during winter, the males come out first and wait for the females to emerge. Some males are able to make themselves smell like females and they lure the other males away before quickly returning so that they can be the first to mate. There are often many more males than females which results in mating balls, where the female has over 10 males swarming all over her in a big ball of snakes. The females don’t lay eggs but give birth to up to 40 live young. Common garter snakes are found throughout North America, from southern Alaska and Canada down to parts of Mexico. They live in a range of habitats, but prefer to live near water. Are there any other interesting facts that you would like to share about common garter snakes?